Takamaru has finally reached Murasame Castle itself. The Mysterious Life Object has twisted the castle and turned it into a giant maze. 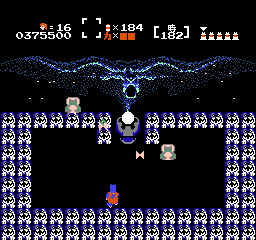 While the enemies in Mursame Castle look different, they are generally more difficult versions of enemies that Takamaru has encountered before. He will have to navigate the path from the entrance to final room where the Murasame statue awaits. If Takamaru can defeat the statue, he will gain entrance to the space beyond where he must defeat the Mysterious Life Object in order to lift the curse from the surrounding towns. 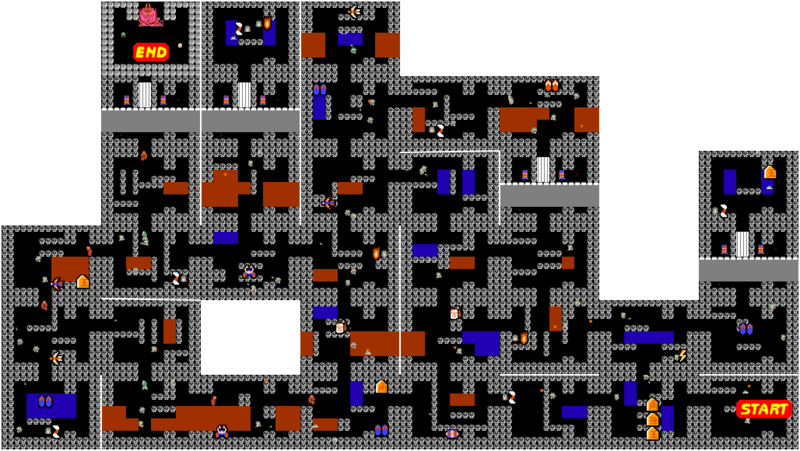 In Murasame Castle, some of the chambers are divided by barrier walls creating dead-ends that prevent you from reaching the paths beyond. Because of the complexity of the castle, and your familiarness with the game at this point, this walkthrough will only detail the portions of the castle that are necessary to complete the stage. There are three types of water in Murasame Castle, regular blue water, invisible black water, and poisonous red water. If you step in red water without the Blue Sandals, you will become frozen in place for a few seconds, unable to defend yourself. Start out by heading to the room to the left. In this room, you can find all three different shot power-ups. Select your favorite, then move to the room above. In that room, an invisible Tanooki holds the Inazuma Lightning technique. From there, go north two rooms until you encounter a drawbridge scene. Two drawbridge guardians prevent you from traveling any further until you defeat them both. Beware of the exploding bullets that they fire when their head pops out. Once the bridge comes down, proceed up. Unless you have the Blue Sandals, steer clear of the red water. Proceed two screens to the left. If by chance you don't have the Blue Sandals, you can find one in the second room to the left. From there, move south as far as possible. Three screens south is a white pillbox in case you need to restore your health. When you reach the bottom, start moving left. 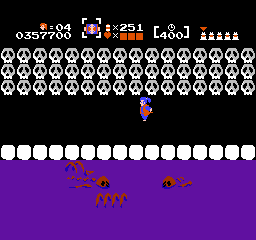 One screen to the left, a helmet can be found beneath the red water. Move right one more screen, up one screen, and right again. The proceed up, and then to the right. You will go up one screen, and up once more and you will encounter another drawbridge. Carefully destroy the drawbridge guardians, and prepare for a big battle ahead. The Murasame Statue will dire two different kinds of attacks at you. One is a glowing orb that will bounce around the room for a little while before leaving, only to be replaced almost immediately. The other is a little face that Mursame fires directly at you. You must dodge it as it comes towards you, and then beware of the shrapnel it releases when it hits a wall. Concentrate your fire on the face of the statue, and you will eventually destroy it. When you are ready, proceed through the newly created hole in its chest. The final phase features only four screens. In the lower three screens, the walls literally fire energy at Takamaru as he runs through it. To add to the difficulty, the paths that Takamaru must pass through are very narrow, so your control over him must be precise, or you'll get stuck and the energy will strike you. The Tanooki in the first screen contains the fire shot. Just before the exit in the third screen, you can find a white pillbox to ensure that you have enough health for the final fight. When you reach the fourth and final screen, you will be in the presence of the Mysterious Life Object that took over the Murasame Statue. Energy will continue to fly towards you, so must continue to dodge it. In the final room, two Tanookis wander around so you can take your pick of fire shots or windmill swords. The object floats above the orb in the middle of the roam, and is only vulnerable to your shot when it's mouth is open. When the object opens its mouth, it does so to attack, so watch out for the kind of attack it uses before getting too close to fire into it. Once you hit the object enough times, you will save Murasame Castle and the surrounding towns. After a brief ending, the game will start over again in the Aosame stage with a higher degree of difficulty. This page was last edited on 14 February 2015, at 16:23.